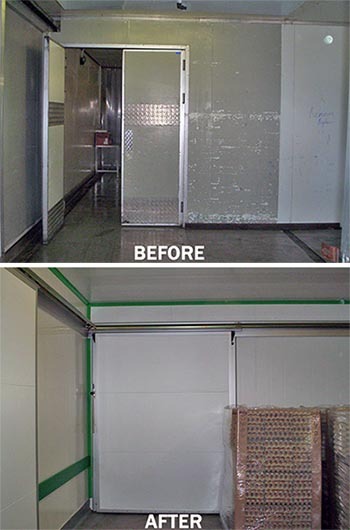 With pressure on businesses to save money it is cheaper to refurbish an existing coldroom, freezer or factory. Coldstorrs can carry out refurbishment work out of hours and at weekends enabling you to carry on production – we can even section off areas, so high care integrity can be maintained. This creates less upheaval as existing plumbing, electrics, fire alarms and sprinkler systems can be used and not switched off for long periods. Also enabling machinery to stay in situ during the majority of refurbishments. Overcladding panels with metal and GRP plastic panelling results in a more hard wearing finish than with a standard panel finish. Once an area has been refurbished, staff are likely to take more care of an area if it looks in good condition so it suffers less damage than older, perhaps even already damaged areas. A refurbished area can also help ensure audits are passed and act as a selling point for visiting customers. Ask us about our hidden fixing, hard wearing overcladding system. So contact us to find out how we can help improve your facilities by carrying out some refurbishment.